Organising a music tour? We’re here to help. We know it can be time consuming to plan a trip, that’s why we work hard to ease the pressure on teachers. Looking for a helping hand for your next music tour? Get in touch today. Call 0845 293 7974 Email us at info@nstgroup.co.uk Visit nstgroup.co.uk or chat online We’re the travel company of choice for over 35,000 group leaders. We’ve been awarded the Feefo Gold Service award, an independent seal of excellence for delivering exceptional experiences, as rated by real customers. With you every step of the way Taking a music tour is widely known to help young people build strong, positive relationships and independence, as well as enhancing performance skills. A music trip often brings a sense of experience and enjoyment to learning, supporting the wider character development and resilience students need to deal with life’s inevitable challenges. At NST, we passionately believe in the importance of enriching experiences outside the classroom. That’s why you won’t find a wider choice of destinations, inspiring performance venues and hands-on workshops anywhere else. This year, we’ve also introduced Valencia to our music tour programme, here students can soak up the Spanish culture of this colourful city, whilst enjoying a range of cultural and performance experiences. When it comes to organising a music tour, we understand just how much time and energy it can take on top of teaching. What’s more, many schools are not aware that when they arrange transport, accommodation, and other services directly themselves, they’ll have all the responsibilities of a travel company - both legal and financial - under the new Package Travel & Linked Travel Arrangements Regulations 2018. That’s where NST can help. We’re an LOtC accredited provider, giving you peace of mind that all the elements of your trip have been carefully checked on your behalf - a view supported by the DfE’s recent recommendations on selecting a travel provider. We’re the travel company of choice for over 35,000 group leaders, but we know that what counts is the help and support that you receive. That’s why we’re committed to doing our absolute best to provide you with the experience and support that you need to match your requirements and budget and create a music tour that your students will remember long after they return. Taking your music further At NST, our dedicated team of music specialists work hard to make your tour a magical and unforgettable experience. From planning and promoting your performances, through to making all your arrangements, you’ll be in good hands with NST. Your on-tour support In many destinations we can offer Concert Assistants and Tour Assistants to give you all the support you need on the ground whilst you’re away. We can now also provide a Tour Manager in all destinations. From teacher feedback we know that on-tour support is important to you. That’s why we can now offer support from a Tour Manager who will assist you throughout the duration of your tour, including at your concerts where they will be on-hand to provide extra support. Many groups have told us this service is important to them. Please ask us for more details. CONCERT ASSISTANTS Your Concert Assistant will meet you at your venues, take care of concert organisation and any issues which may arise, so that you and your group can concentrate solely on preparing for your performance. their job to piece together a travel package of accommodation, transport, visits and leisure activities around your performance schedule to ensure that you get the right balance of concerts and visits. NST staff were extremely helpful and came back with a response to all queries quickly and were very amenable. It made the whole process less stressful. Thank you. ✓ select venues that regularly attract good audiences, and we’ll schedule your concerts at the best times to maximise audience potential. ✓ invite local youth and cultural groups to your concert (where appropriate) and, where possible, we’ll organise joint concerts and festival participations to attract the largest possible audiences. and on radio where possible. Paris, making Paris the perfect choice for a variety of groups. It’s also ideal for a combined music, art and French language tour, with plenty to see and do. At a glance Getting there We offer a range of transport options, including executive coach (with trailer option for instrumental groups) via ferry or Eurotunnel, and flights. Montparnasse Tower Observation Deck which is quieter, more affordable and offers a great view of the city, including the Eiffel Tower. • Applications for summer performances in Paris parks are submitted in January so book early. group travel insurance & 1 in 8 free place ratio. Price shown based on 40 paying passengers from selected departure points, travelling April 2020. Take part in Disney Performing Arts OnStage and Disney Performing Arts Workshops, plus enjoy the magic of Disneyland® Paris too. technique, to the delights of live performance. breath control, diction and voice production. groups. Please call for further details. participate in a weekend mass. and tourists gathered on the lawns. your tour than to perform in a setting as special as this. alike from your stage on the bandstand podium. market area of Les Halles and participate in a choral evening mass. boasts an excellent events programme which includes concerts given by resident groups. the world of entertainment at Disneyland® Paris! suitable for a variety of groups. permanent collection will take you on a chronological circuit through western music, from the 17th century. places of many musical luminaries. any issues which may arise. NST’s Paris City Representative, Aliya, or a member of her team will meet you on arrival, assist you with hotel check-in, advise you on points of interest and public transport and provide 24 hour emergency assistance. performance opportunities as part of concert programme – see page 8. Concert at Square Jean XXIII. Day 2	1-hour Seine river cruise. recreational facilities. A Disney® selected hotel, located in the Val de France. Popular with music groups. Our performance at the Disney Videopolis Stage was amazing! It’s a fantastic venue and a great opportunity for the kids. All NST consultants were fabulous and our drivers were superb from beginning to end. Another amazing concert tour with NST. Whether experienced or just starting out, this region offers varied performance opportunities at great value. Host concerts in wonderful churches and cathedrals, at popular city squares, on coastal town bandstands, in municipal gardens and even at bustling theme parks. Boost novices’ confidence with appreciative audiences, and feed experienced performers’ enthusiasm at the prestigious venues in Bruges, Ghent and Brussels. ideally located for visits and venues in the region. • Many roads are closed on Bastille Day (14th July) and the days around this. Shops are generally closed on Sundays too. We will plan your itinerary accordingly. • This region is popular for many types of school trip, from music to history and languages. We recommend you book early to secure your preferred dates and accommodation. Additional support available Tour Manager – see pages 4-5. Price includes: 3 nights’ full board at NST's Château d’Ebblinghem, executive coach transport from & to school & throughout your stay, organisation & publicity of 3 concerts, extensive group travel insurance & 1 in 8 free place ratio. Price shown based on 40 paying passengers from selected departure points, July 2020. Christmastime - music, markets and more! Delight in the build-up of excitement before Christmas by combining your music tour with a Christmas market experience. We can arrange for your group to enjoy magical performances at the Bruges, Ypres or Lille Christmas markets. A stay at NST’s exclusive school group accommodation, the Château d’Ebblinghem, will get you further into the Christmas spirit too. This ideal base hosts its own magical festive experience each year. From here you can visit up to three Christmas markets (Lille, Bruges & Ypres), enjoy a Christmas quiz night and a five-course traditional Christmas dinner. What better way to spend ‘the most wonderful time of the year’! tourists and locals tend to congregate. and is reputed to be the best preserved medieval city in Europe. perform at this stunning cathedral. De Haan, Ostend, Nieuwpoort and De Panne. Enjoy a fun theme park performance. Choirs and bands can perform two hymns at this daily ceremony commemorating the fallen of WWI. An incredibly moving experience for groups who are often able to lay a wreath. Perform and, on occasion, be recorded in a specially designed concert hall at the Musical Instrument Museum in Brussels. Make sure you visit the fascinating museum too. Popular options include Bagatelle theme park, the WWI Battlefields and the Ledoux Chocolate Factory tour. Excellent facilities. Rehearsal space and flexible meal times. Day 2 Day visit to Bruges. FRANCE Exclusive school group accommodation. Pupil and teacher rooms located together alongside dedicated dining and teacher areas. Lunchtime concert in the market square. easy reach of the centre of Ypres. Good value for money and highly recommended. in accommodating groups of young people. Concert in the Cloth Hall Courtyard, Ypres. 2 course meal in local restaurant. Participate in the Last Post Ceremony at the Menin Gate. Abbey and St George’s Anglican Church, visiting the city of Bruges and visiting the Tyne Cot Cemetery. school. For prices for this itinerary, please call us. The towns and villages alongside these two rivers have an excellent range of both indoor and outdoor venues and a varied choice of excursions. Groups can perform in beautiful spa resorts, bandstands and town squares where they will receive a warm welcome and can perform in a safe, relaxed environment. This region is a firm group favourite. Cologne at Christmas NST offers a unique opportunity for your group to explore traditional stalls and activities then perform a Christmas programme at the markets in Cologne. Why not combine this with a sacred performance from a choice of other popular venues? Price includes: 4 nights’ full board accommodation, executive coach transport from & to school & throughout your stay, organisation & publicity of 3 concerts, extensive group travel insurance & 1 in 8 free place ratio. Price shown based on 40 paying passengers from selected departure points, April 2020. The choir’s performance was wonderful, they sang really beautifully! I would like to thank you kindly that we could organise this performance together. also be possible to perform at evening mass. • TRIER BRUNNENHOF This courtyard setting is ideal for concerts. Perform in parish and city churches. • RÜDESHEIM MARKT Perform in the historic, cobbled market square. An ideal venue for all groups. self-playing instruments. For a fact-filled time, visit Beethoven’s House in Bonn or the Beethhoven Museum in Koblenz. Wave Pool and enjoy Cologne’s Chocolate Museum. Where you will be staying HOTEL BERGSCHLÖSSCHEN, BOPPARD Pleasant hotel, with friendly, flexible owners, located in a tranquil, residential setting within 15-20 minutes’ walk of Boppard centre. Day 2 Rhine boat cruise. Concert at a local parish church. Day 3 Full day excursion to Moselle. A&O COLOGNE NEUMARKT This modern, budget hostel with 173 rooms is centrally located. The rooms are spacious and bright with all modern facilities. Visit the bustling resort of Cochem. Day 4 Shopping and sightseeing in Cologne. Lunchtime concert at Cologne Cathedral. A high quality, single group hotel in the centre of Boppard. The owners are very hospitable and experienced in handling youth groups. A warm welcome is assured and many groups return year after year. With its mix of culture, beautiful lakes and stunning panoramic views, the Black Forest will give your group a traditional German experience. This scenic region is home to a wide range of performance venues, many set in idyllic locations. NST can combine performances and visits in France and Germany for a memorable two country tour. Best time to travel Popular travel dates for music groups range from May through to October. Price includes: 4 nights' full board accommodation, executive coach transport from & to school & throughout your stay, organisation & publicity of 3 concerts, extensive group travel insurance & 1 in 8 free place ratio. Price shown based on 40 paying passengers from selected departure points, April 2020. In the build-up to Christmas, take your group on an exciting trip to a winter wonderland in Germany or France. Exciting festive performance opportunities await, and pupils can also get to practise and improve their language skills, enrich their cultural understanding and connect as a group. Enjoy tobogganing and ice-skating, a trip on a Ferris wheel and city sights too. of Europe’s most vibrant cities. Christmas quiz night and a fivecourse Christmas dinner. Price includes: 1 night's full board accommodation at NST's Château d’Ebblinghem, executive coach transport from & to school & throughout your stay, extensive group travel insurance & 1 in 8 free place ratio. Price shown based on 40 paying passengers from selected departure points, December 2019. Ready to start planning your next music experience? The coastal resort of Noordwijk is a consistently popular, great value destination for groups. It is ideally positioned for the many coastal venues as well as a visit to Amsterdam. From performances in shopping centres and town squares to a variety of churches, this destination offers pretty coastal towns in contrast to the rich culture and vibrancy of Amsterdam. instrumental groups) via ferry or Eurotunnel and flights. Best time to travel Popular travel dates for music groups range from Easter through to October. Ideal for • sacred choirs • bands • secular choirs Additional support available Tour Manager, Tour Assistant and Concert Assistant – see pages 4-5. Delft Market Place Concerts in this attractive square always draw good audiences through spring and summer. Price includes: 3 nights' full board accommodation, executive coach transport from & to school & throughout your stay, organisation & publicity of 3 concerts, extensive group travel insurance & 1 in 8 free place ratio. Price shown based on 40 paying passengers from selected departure points, April 2020. Valkenburg and the South Limburg region offer the ideal destination for bands with popular programmes (as well as less experienced performing groups), who are looking to perform in a variety of venues, especially open-air locations. It is easy to create an ‘international’ tour from here, due to its proximity to Belgium, Germany and Luxembourg. instrumental groups) via ferry and Eurotunnel. groups range from Easter to October. This imposing city centre bandstand is perfect for instrumental groups. Barcelona has a multitude of fantastic museums and galleries, while its historic past provides a wealth of cathedrals and memorable performance venues. Coastal parish churches attract good audiences, as do beach resorts in the summer. NST has a wide range of accommodation in the surrounding coastal towns, which provide a fabulous mix of concert venues, leisure activities and sandy beaches. easy access to the city. • Due to the heat, most performances during summer months take place in the evenings when it is cooler. • Barcelona offers some great free visits such as the Olympic stadium viewing platform, the MNAC art museum and the Picasso Museum. We can provide you with full details. Additional support available Tour Manager and Concert Assistant – see pages 4-5. Tour highlight MONTSERRAT MONASTERY Groups of sacred or classical repertoire wanting to perform here will be given ten minutes to sing in the basilica before the world-famous Montserrat Boys’ Choir give their daily recital of the ‘Salve Regina’. Price includes: 7 days, 4 nights' half board accommodation, executive coach transport from & to school & throughout your stay, organisation & publicity of 3 concerts, services of a Concert Assistant in-resort, extensive group travel insurance & 1 in 8 free place ratio. Price shown based on 40 paying passengers from selected departure points, May 2020. Montserrat was the highlight of our concert tour for many of our pupils and having the opportunity to sing there is an experience that will stay with us for a long, long time. It was an absolute privilege. sacred choirs to participate in mass services. • GIRONA CATHEDRAL Perform in the ancient walled city of Girona. Where you will be staying BARCELONA URBANY HOSTEL This new hostel in central Barcelona marks an exciting development to the city’s pupil accommodation scene. Simple rooms, great facilities and a competitive price. HOTEL SILKEN CANADA PALACE The hotel is located in the seaside resort of Calafell, close to the beach, shops and restaurants. HOTEL SA RIERA A medium sized hotel with 90 comfortable rooms spreading over 4 floors. Enjoy a fascinating flamenco show, based on the passionate art of Flamenco dancing, then follow on with a flamenco lesson. Visit the astounding Montjuïc Magic Fountains, the opera at Gran Teatre del Liceu, Museu Pau Casals in El Vendrell or take a guided tour of Palau de la Musica Catalana. Sample itinerary Day 1 Morning departure for overnight journey. Day 2 Check into accommodation. Evening meal. Local orientation. Day 3 Free time to rehearse or spend in resort. Visit to Dalí Museum, Figueres. Evening meal. Concert in Tossa de Mar Town Square. Day 4 Barcelona - visit Park Güell, stroll down Las Ramblas, visit Port Vell. Guided tour & choral performance at Sagrada Família. Evening meal. Day 5 Day at Port Aventura. Evening meal. Concert at local hotel. Day 6 Free time. Depart for return overnight journey. Day 7 Arrive at school. For prices for this itinerary, please call us. Music runs in the blood of Valencian people. It is obvious from the sheer number of Valencians, both young and old, who belong to a band and are passionate about music. Here, groups can soak up the Spanish culture of this colourful city, whilst enjoying a range of cultural and performance experiences. Getting there We offer flights to Alicante and Valencia from a variety of departure airports. Best time to travel Valencia is a year-round destination Ideal for • sacred choirs • youth orchestras • secular choirs Additional support available Tour Manager, Concert Assistant – see pages 4-5. An underground cave with incredible acoustics for performances. is a modern hotel with bright, functional rooms. Hotel Expo offers a good standard of accommodation, in the bustling city of Valencia. Price includes: 4 nights' half board accommodation, return flights from a London airport (other departure airports are available) & overseas airport transfers, coach transportation for 3 concerts, organisation & publicity of 3 concerts, services of a Concert Assistant in-resort, extensive group travel insurance & 1 in 10 free place ratio. Price shown based on 35 paying passengers travelling November 2019. A tiny island steeped in culture, Malta is a very special destination for a music tour. The strong band culture in Malta provides us with fantastic concert halls and outdoor performing arenas. The island also has a wonderful choice of large cathedrals where we host our choral concerts. Match this with a wonderful climate and the welcoming, friendly people and Malta shines out as an ideal music tour destination. Getting there We offer flights to Malta from a variety of departure airports. Best time to travel This is a popular destination for music groups year round. Ideal for • sacred choirs • bands • youth orchestras • secular choirs Additional support available Tour Manager and Concert Assistant – see pages 4-5. Price includes: 3 nights' half board accommodation, return flights from a London airport (other departure airports are available) & overseas airport transfers, coach transportation for 3 concerts, organisation & publicity of 3 concerts, services of a Concert Assistant in-resort, extensive group travel insurance & 1 in 10 free place ratio. Price shown based on 35 paying passengers travelling October 2019. Summer is one of the best times to enjoy all that Lake Garda has to offer. There are many festivals, outdoor venues and holiday villages around the lake that welcome our music groups. As a base, Lake Garda is a great destination which allows groups to visit Verona and Venice for a day trip. Getting there We offer a range of transport options, including executive coach (with trailer option for instrumental groups) via ferry and Eurotunnel, and flights. Best time to travel Popular travel dates for music groups range from Easter through to October. • Due to the summer heat, concerts generally take place in the evening at around 9pm. • We recommend packing insect repellent for those concerts by the lake. Additional support available Tour Manager, Tour Assistant and Concert Assistant – see pages 4-5. Price includes: 7 days, 4 nights' half board accommodation, executive coach transport from & to school & throughout your stay, organisation & publicity of 3 concerts, services of a Concert Assistant in-resort, extensive group travel insurance & 1 in 8 free place ratio. Price shown based on 40 paying passengers from selected departure points, October 2019. Cate Gardner, Head of Music at Archbishop Temple School, took her group to Lake Garda with NST. “We had such a wonderful time. It was a great opportunity for pupils to widen their musical and cultural experiences and bond as a band. The highlights of our trip were visiting and performing in Sirmione, a trip to Venice, having a fun day out at Gardaland Theme Park and playing in the swimming pool. I would definitely recommend the tour and NST to other music groups. It was an excellent trip with some superb concert venues and lots of culture”. music with the local community. ST MARK’S BASILICA, VENICE Sacred choirs may travel to Venice for the day to sing at mass in this world-renowned venue, made unique by both its wealth of history and its magnificence. • SAN GIORGIO EN BRAIDA, VERONA Ideal for choral and orchestral groups. • CHIESA PARROCCHIALE DI MALCESINE A parish church well-known to locals and tourists. guest entertainment. • PASTRENGO MUSIC FESTIVAL The town hall's Pop-Soul-Jazz festival for groups with a lively, entertaining repertoire. Aqua Paradise, Canevaworld, Movieland Park and Malcesine Castle. Where you will be staying HOTEL SAN VITO, NEGRAR This family run hotel offers a friendly welcome, excellent food, and plenty of space for groups to meet. Concert at 5-star camping resort. Day 5 Visit to Verona. Free time and late afternoon concert at private beach venue. Depart for return overnight journey. Day 7 Arrive at school. For prices for this itinerary, please call us. of facilities and a warm welcome to a large number of youth groups throughout the year. There's nowhere quite like Venice, with its small islands separated by canals and linked by bridges, and its unique Venetian atmosphere. The city offers culture paired with superb concert venues ideal for choirs. Audiences are warm and enthusiastic and the variety of sightseeing opportunities means days are filled with both educational and fun activities to suit all ages. Getting there We offer a range of transport options, including executive coach via ferry or Eurotunnel, and flights. Best time to travel Popular travel dates for music groups range from Easter through to October. Ideal for • choirs Additional support available Tour Manager, Tour Assistant and Concert Assistant – see pages 4-5.
participate in a church service. St Mark’s Basilica Sacred choirs may sing at mass in this world-famous Byzantine basilica. Price includes: 3 nights' half board accommodation, return flights from a London airport (other departure airports are available) & overseas airport transfers, organisation & publicity of 3 concerts, services of a Concert Assistant in-resort, extensive group travel insurance & 1 in 10 free place ratio. Price shown based on 35 paying passengers travelling November 2019. Rome offers a unique collection of world-class venues, as well as the attractions of a city of history and glamour. We particularly recommend it for choral groups and NST can build an itinerary that includes performing in some of the most famous churches in the world. NST groups are welcomed at many churches to participate in the mass. Getting there We offer flights to Rome from a variety of departure airports. Best time to travel This is a popular destination for music groups year round. Ideal for • sacred choirs Additional support available Tour Manager, Tour Assistant and Concert Assistant – see pages 4-5. The Basilica of St Peter in the Vatican City Choirs of a high standard may be invited to sing during mass. Price includes: 4 nights' half board accommodation, return flights from a London airport (other departure airports are available) & overseas airport transfers, organisation & publicity of 3 concerts, services of a Concert Assistant in-resort, services of NST Rome Representative to assist with check-in & provide 24hr assistance, extensive group travel insurance & 1 in 10 free place ratio. Price shown based on 35 paying passengers travelling November 2019. Our groups are usually based in Montecatini Terme, an attractive town famous for its many natural thermal spas and surrounded by the Tuscan Hills. Florence, Pisa, Siena and Lucca are within easy reach and offer excellent concert venues and performance opportunities for all types of music group whether choral or instrumental. Getting there We offer a range of transport options, including executive coach (with trailer option for instrumental groups) via ferry and Eurotunnel, and flights. Best time to travel Popular travel dates for music groups range from Easter through to October. Ideal for • choirs • bands • orchestras • mixed ensembles Additional support available Tour Manager, Tour Assistant and Concert Assistant – see pages 4-5.
thermal spas that offer choral and instrumental groups the opportunity to perform. Price includes: 4 nights' half board accommodation, return flights from a London airport (other departure airports are available) & overseas airport transfers, 4 days' coaching in resort, organisation & publicity of 3 concerts, services of a Concert Assistant in-resort, extensive group travel insurance & 1 in 10 free place ratio. Price shown based on 35 paying passengers travelling November 2019. A beautiful city, with a marvellous cultural tradition, that offers music groups the opportunity to perform in wonderful venues and settings. An NST itinerary will also integrate the splendid medieval squares, breathtaking Baroque churches and palaces, and intriguing streets with gift shops and street entertainers. for instrumental groups) via ferry or Eurotunnel, and flights. Best time to travel Popular travel dates for music groups range from February through to October. 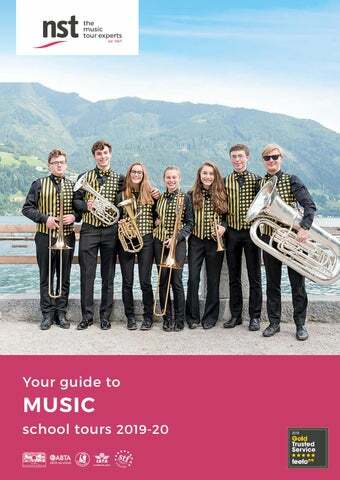 Ideal for • sacred choirs • bands • youth orchestras • secular choirs Additional support available Tour Manager and Concert Assistants – see pages 4-5. St Nicholas’ Church Choirs and classical orchestras can perform in this beautiful Baroque church. Salzburg has an historic musical tradition and always provides our groups of all abilities with an enthusiastic reception. Groups can follow the ‘Sound of Music’ in Salzburg and its surrounding towns, performing in spa venues and bandstands against beautiful backdrops. Surrounding areas also provide a number of attractions and outstanding scenery that can be included in your itinerary. Getting there We offer a range of transport options, including executive coach (with trailer option for instrumental groups) via ferry or Eurotunnel, and flights. Best time to travel Popular travel dates for music groups range from May through to October. Ideal for • sacred choirs • bands • youth orchestras • secular choirs Additional support available Tour Manager – see pages 4-5. Mirabell Gardens Play outdoors in the gardens of the famous Schloss Mirabell. Price includes: 7 days, 4 nights' full board accommodation, executive coach transport from & to school & throughout your stay, organisation & publicity of 3 concerts, extensive group travel insurance & 1 in 8 free place ratio. Price shown based on 40 paying passengers from selected departure points, May 2020. Vienna hosts some of the most prestigious venues in Europe, and is ideal for more formal groups. Rich in the tradition of classical music, Vienna’s wonderful churches provide sacred choirs and orchestras with prestigious concert locations. The surrounding areas of the city also provide a number of attractions and outstanding scenery that can be included in your itinerary. for instrumental groups) via ferry or Eurotunnel, and flights. Best time to travel Popular travel dates for music groups range from February through to October. Ideal for • sacred choirs • bands • youth orchestras • secular choirs Additional support available Tour Manager – see pages 4-5. St Stephen’s Cathedral Perform at midday or morning mass, followed by a short recital, at this cathedral. Price includes: 4 nights' B&B accommodation, return flights from a London airport (other departure airports are available) & overseas airport transfers, coach transportation for 3 concerts, organisation & publicity of 3 concerts, extensive group travel insurance & 1 in 10 free place ratio. Price shown based on 35 paying passengers travelling November 2019. The city that never sleeps! Manhattan is a fast-paced, exciting metropolis offering music groups of all types and abilities a wide range of performance venues. To create a truly memorable experience for your group, NST will arrange an itinerary that also includes many of the attractions that this amazing city has to offer, at the very best group prices. • New York is best explored on foot or via subway. We can help you with subway ticket options. • Winter indoor venues are mainly community centres and schools. • Don’t forget to budget for tipping. We can offer you advice on how much to take. Additional support available Tour Manager, Tour Assistants and Concert Assistants – see pages 4-5. Price includes: 6 days, 4 nights' room only accommodation, return flights from a London airport (other departure airports are available) & overseas airport transfers, organisation & publicity of 3 concerts, extensive group travel insurance & 1 in 10 free place ratio. Price shown based on 35 paying passengers travelling February 2020. Broadway shows A POPULAR CHOICE! Broadway is crammed with an array of spectacular theatrical performances to choose from. We work closely with theatres and agencies to give you access to great group prices, fantastic seats and great availability on the most popular options. Popular shows include: • WICKED The untold musical story of The Wizard of Oz’s Wicked Witch of the West and Glinda the Good... before Dorothy dropped in. • SCHOOL OF ROCK A wannabe rock star sets his sights on turning his pupils into a mind-blowing rock band for the Battle of the Bands. flight deck. Equipment hire packages available. At your leisure For unbeatable city views, consider the Empire State Building, Top of the Rock or a Landmark Cruise. Bring history to life on a Manhattan walking tour, the Statue of Liberty and Ellis Island or visit the moving National September 11 Memorial and Museum. Youth hostel offering simple standard of accommodation but excellent value with the benefit of a central location. Recreational facilities on site. Evening visit to the Empire State building. Day 2	Explore sites of Midtown Manhattan. Concert at the Intrepid Sea Air & Space Museum. Day 3	Explore 5th Avenue. Afternoon concert in Central Park. Day 4	Top of the Rock. Concert at the Cathedral of St John the Divine. Daytime flight and transfer to accommodation. brought to life on stage. Radio City Music Hall tour. Day 5	Free time for last minute shopping and sightseeing. Day 6	Arrive in UK. For prices for this itinerary, please call us. COURTYARD MIDTOWN EAST An excellent hotel with a good range of facilities , located in the heart of midtown Manhattan. Groups are assured of a comfortable stay. The wide number and variety of performance venues available in London make it an ideal destination for groups of all ages and abilities. These outstanding venues, along with the great range of amazing West End theatre shows, workshops, backstage tours and leisure visits, mean NST can provide a great value itinerary that engages, wows and inspires. Getting there We offer a range of transport options, including executive coaches (with trailer option for instrumental groups), rail and flights. order to secure the best availability and prices. • If you are on a budget then London offers plenty of free, fun and educational museum visits which often include workshops. We can advise on all the opportunities available to you. Additional support available Tour Manager – see pages 4-5. Price includes: 1 night B&B accommodation, executive coach transportation from and to school and throughout your stay, group travel insurance, 1 in 8 free place ratio. Price shown based on 40 paying passengers from selected departure points, travelling November 2019.
in this beautiful Baroque church. of performances throughout the year. The church offers mixed programmes alongside the prestige of location and renown in the actor community. railway station also includes a large bandstand. Long revered as the burial place of Thomas Tallis. A memorable venue for musicians. West End musical director. Share all you have learnt in a performance for a show cast member. rare opportunity to perform songs from Disney’s Aladdin or The Lion King. Led by a Disney Teaching Artist. In an exclusive partnership with NST, and hosted by a BBC Ten Pieces champion, these body percussion masterclasses can turn even the most reserved group into a smiling, enthusiastic drum orchestra. You'll be in for a hand clapping, toe tapping, stomping good time. Develop improvisation, ensemble techniques, performance and communication skills. We can even tailor the workshop length and content to your exact needs. GCSE, AS and A-level syllabus. to watch both rehearsals and performances, tour the backstage area and enjoy talks and tours. An amazing insight into working in the performing arts. lunchtime and rush-hour concerts across London. A trip to London wouldn't be complete without partaking in a few firm itinerary favourites - all at great group prices. The Coca-Cola London Eye boasts a fantastic bird’s eye view. Take to the water and see this iconic landmark, amongst others, on a Thames river cruise. Let's not forget the world-class museums and galleries on offer in the city too. Whether science, history or even art, there are so many to choose from. propaganda, tolerance, bullying and friendship. Day 1 Morning departure from school. Body percussion workshop. West end show. Day 2	Royal Opera House tour. Song in Performance workshop. Return to school. For prices for this itinerary, please call us. Other West End shows are available. Visit nstgroup.co.uk or call for details. MEININGER HOTEL LONDON HYDE PARK In an ideal central location offering a unique blend of high quality accommodation, full meal options and large selection of conference rooms. PREMIER INN Comfortable hotel, belonging to the Premier Inn chain, located close to a tube station. YHA THAMESIDE Youth hostel offering basic accommodation and good facilities at a reasonable price. PERFORMANCE FOCUSED Day 1 Morning departure from school. Local exploration & rehearsal time. Coca-Cola London Eye. Day 2 Time in Covent Garden. Concert in The Actors' Church, St Paul’s Covent Garden. Evening meal at Planet Hollywood. Day 3	Morning rehearsal. Concert in Victoria Embankment Gardens. West End show. Day 4	Royal Opera House tour. Return to school. For prices for this itinerary, please call us. Exciting things have been happening in Liverpool over recent years, and this vibrant city offers lots to see and do. Liverpool is a UNESCO City of Music for good reason. Here you’ll find plenty to inspire your pupils. From performances at world-famous and impressive venues, to the many fascinating musical experiences available. This, the hometown of The Beatles, is set to impress. Getting there We offer a range of options to get you to and around your destination – and back home again – with ease, including executive coach (with trailer option for instrumental groups). British Music Experience, Liverpool The British Music Experience, a unique learning resource, tells the story of over 70 years of British Music history through costumes, instruments, performance and memorabilia from the Beatles and Bowie to Adele, Oasis and X Factor. Discover how music has influenced art, fashion and even the Government. Pupils can also try the vocal booth, dance the decades or play top guitars and drums. the music while the Cathedral Choir is on vacation. can perform in the iconic Cunard Building. the life of the Cathedral. Best of the rest • LIVERPOOL CITY SPACES, INC. MATHEW STREET Set the atmosphere alight in Liverpool’s trendy city spaces. Limited performance opportunities at showcase nights. Manchester’s city centre. A guaranteed audience, whatever your style of music. of all kinds, from classical to contemporary, rock, pop, roots and folk. Go behind the scenes at Anfield, home of Liverpool FC. Enjoy expert commentary aboard the Mersey River Explorer. Visit Tate Liverpool, a spectacular museum of modern and contemporary international art. Shop your socks off at Liverpool ONE Shopping Complex, or view Liverpool’s fantastic skyline from the Radio City Viewing Tower. All hotels belonging to the Premier Inn chain offer comfortable accommodation and are located close to transport links, offering easy access to the city. YHA LIVERPOOL HOSTEL YHA Liverpool is right at the heart of everything Liverpool has to offer. A great, budget option for groups. Visit & perform at the British Music Experience. Watch a show or concert at Liverpool Empire theatre or Philharmonic Hall. Day 2 Mersey river explorer cruise. Cantabria This beautiful province in the north of Spain is increasingly popular for NST groups looking for a new destination on a limited budget. Cantabriaâ&#x20AC;&#x2122;s rich history and blend of peaceful coastal towns and mountain villages provide a number of unique performance venues for your pupils to enjoy. Madrid This historic, exciting city and its surrounding communities have an ideal combination of venues that attract enthusiastic audiences and cultural attractions for groups to explore. Home to a wonderful cathedral, church venues and a warm climate, Madrid is a truly memorable destination for your music group. We pride ourselves on offering quality music experiences for all types of groups around the globe. Here are a few more of our destinations that are growing in popularity. Don't forget to visit our website for further details of all our destinations. You'll find information on venues, musical experiences, visits, popular itineraries, transport, support and accommodation descriptions too. You can even start planning your itinerary online and request a quote at the click of a button. Krakow With a wonderful cultural heritage, this increasingly popular city has a fabulous range of formal venues. We highly recommend Krakow as an alternative destination for established, quality choirs and orchestras and our relationship with the concert promoters ensure consistently good audiences. Budapest A truly musical destination, Hungary offers musicians and singers alike the opportunity of walking in the steps of such famous names as Liszt, Bartok and Kodaly. Concert venues and excursions are exciting and varied, and the richness of the musical legacy shows in the enthusiastic audiences that await our groups. MUSICAL T H E AT R E T R I P S London & New York are fantastic destinations full of opportunities to expose your group to music. Our group favourites include New York & London.